Abies lasiocarpa 'DuFlon' is arguably one of the smallest available cultivars of Alpine Fir. The overall structure of a mature specimen is symmetrical and ball shaped with rich-green needles and small rounded buds, somewhat atypical for the species. After many years, a weak leader may develop but this is a rare occurrence. Annual expected growth is less than 1 inch (2.5 cm) producing a 10 inches (25 cm) round ball of needles after 10 years. 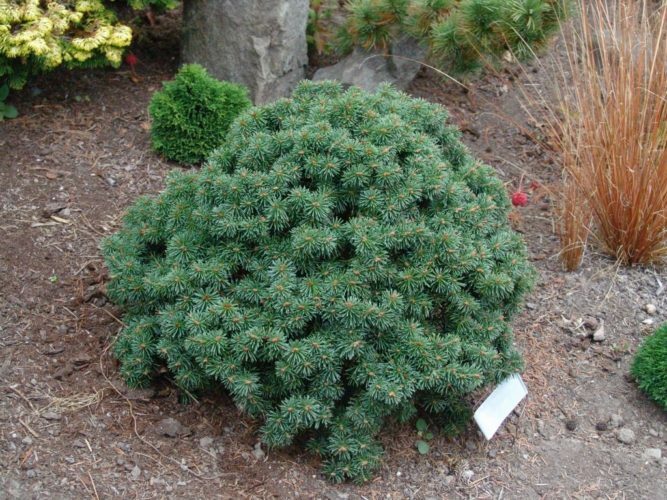 This plant is one of the absolute "must-have" cultivars for the miniature conifer collection. It is a perfect choice for a rock garden or trough planting. In, 1954 Alton and Bita DuFlon were hiking near Lake Cushman in the Olympic National Park of Washington State when they came across a congested little tree that must have been more than 100 years old. They were able to transplant this tree to their home in Seattle. After some time, this plant came to the attention of Ed Lohbrunner, the owner of Lakeside Gardens, a nursery specializing in alpine plants, in Victoria, British Columbia. Lohbrunner would periodically visit the DuFlons attempting to obtain propagation material from this diminutive fir. Eventually, the DuFlons allowed Lohbrunner to take three small pieces from the miniature tree. He was able to root the three pieces and grew them on with the idea of using them as stock plants. When Bob Fincham met Bita DuFlon in 1989, she told him how upset she became whenever she heard that urban legend. As a professional gardener she would never have done such a foolish thing. Bob says he still comes across that story from time to time and hopes that telling the true story as he heard it from Mrs. DuFlon that he will "bury it." Numerous spellings exist in the trade such as Duflon, which is how it is listed in the RHS Horticultural Database, or Du Flon. Neither spelling is correct. In the course of doing research for his book, Small Conifers for Small Gardens, Bob Fincham was able to determine the correct spelling of Alton DuFlon's name by reviewing public records. Abies lasiocarpa 'DuFlon' at Dave Helms' garden in Mount Vernon, WA.